This Kato Tackle Bag is a large-sized fishing tackle bag madeof 600 PVC. It is designed to not only hold your tackle, but also to organizeit. This bag is perfect for day trips on the water. 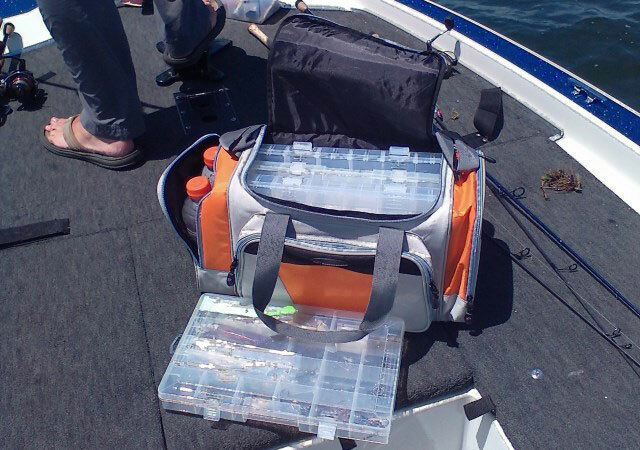 The 14.5-by-8.5-by-10-inch bag comfortably holds four largetackle trays and has three main pockets to hold your gear. The pocket in thefront has a large zipper. When opened, the pocket folds down and has anadditional zipper pocket that could be used for a cell phone or any other gear.Also in the front pocket, is a key chain clip and additional lashing straps. The two side zipper pockets are big enough to hold two one-quartdrinks each. On the exterior of each side pocket are additional mesh pocketsthat are perfect for soft baits or bags of plastics. The top also hasadjustable lashing cord that allows the user to quickly secure his or her rainjacket, or other gear to the bag. The bottom of the bag is reinforced with a heavyduty outer cover and has four rubber feet to prevent the bag from slidingaround and to keep water from getting in from the bottom. The large, adjustable and paddedshoulder strap allows you to carry the bag while leaving both hands free to dealwith other gear. Review written by Frank Anthonis, field staff for www.GarysOutdoorNewsandReviews.net.